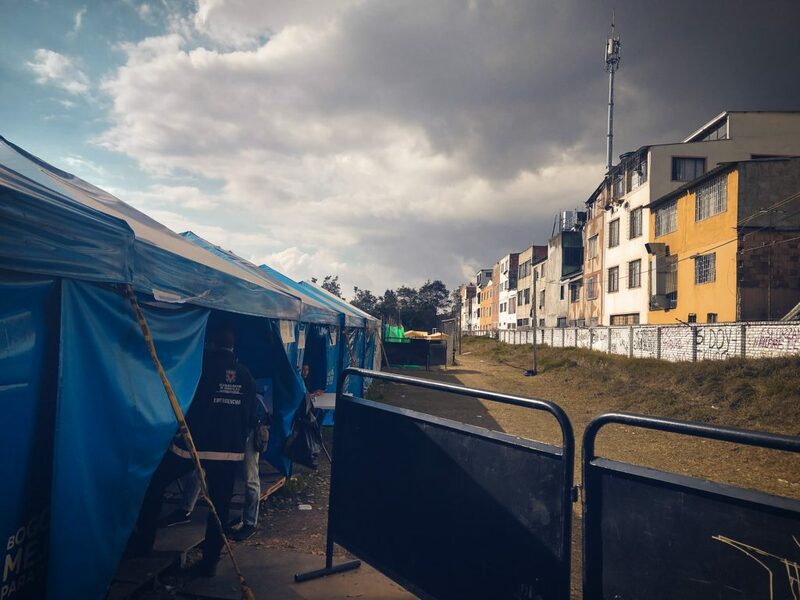 NOTE: Members of our team, including Co-Founder Miguel Morel, have spent time on the ground in Bogota interviewing Venezuelan refugees to better understand the conditions they fled and the challenges they - and their family members who remain in the country - face moving forward. In the following article, first published in Palladium, Miguel shares an inside look at the desperate situation in Venezuela. Venezuela is in a downward spiral. The Americans are involved. The Cubans are involved. The Russians are involved. Other countries you’ve probably never heard of are involved. The epistemic environment is poisoned by divergent geopolitical interests. Affairs in Venezuela are thus opaque. American discourse on this issue unsurprisingly contextualizes the crisis in terms most relevant to domestic political battles, namely point-scoring in the tiresome capitalism vs. socialism ideological war. This is probably the least helpful framing for understanding what actually went wrong. And something has gone deeply wrong. The only thing more interesting than analyzing a failed state from the comfort of one’s armchair is seeing it in person, so I packed my bags and bought a plane ticket to Latin America. The embassy wouldn’t give me a travel visa to Venezuela itself because I’m American, but many Venezuelans have fled to Colombia and Argentina. 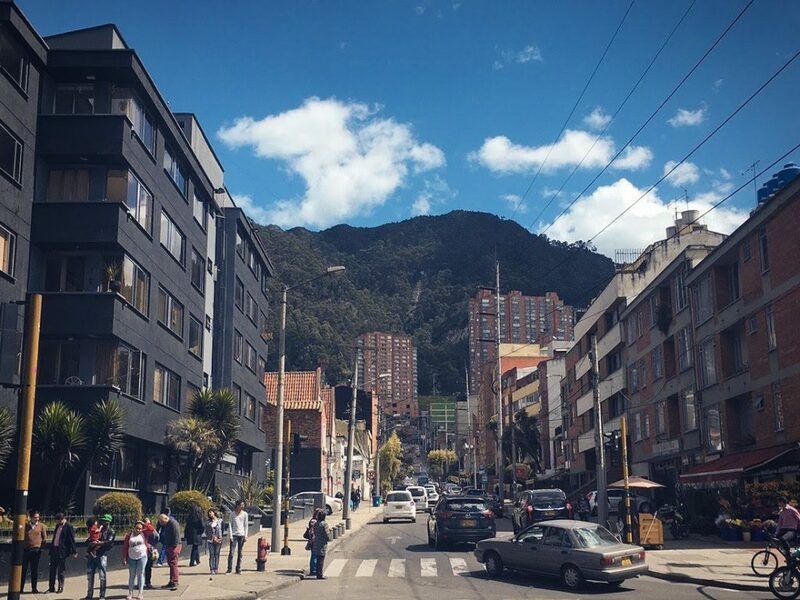 Everyone there has front row seats to the crisis, so I headed to Bogotá, the capital of Colombia. Conrad Weiss, a Palladium correspondent from Europe, didn’t even need a visa. He flew directly to Caracas. 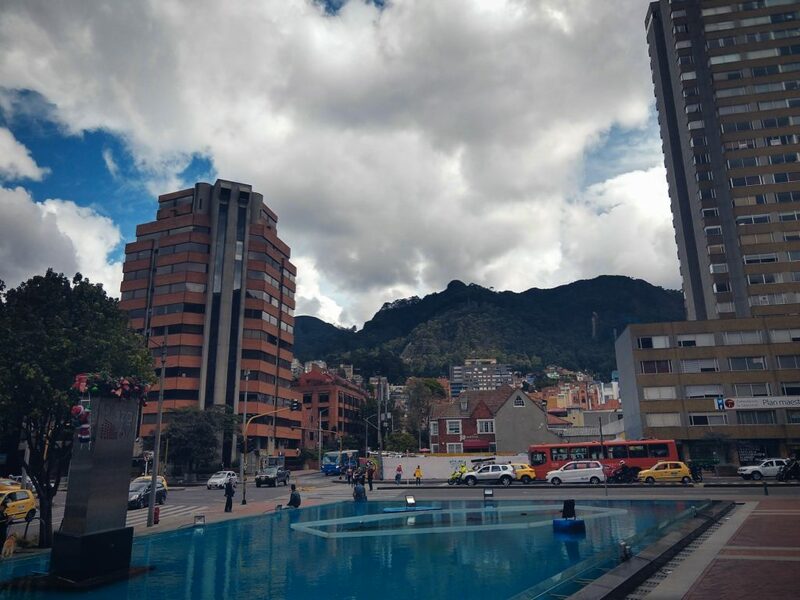 The climate in Bogotá is mountainous. At more than 8,000 feet in elevation, you can feel the temperate, almost cold, weather. The airport itself is full of security guards in military-style fatigues with drug-sniffing dogs on full alert. I quickly went through the terminal to immigration, where I was greeted by a stern-faced officer. Other people were being harassed. He stared at me. I handed him my American passport. Stamp. By the time I left the airport, it was almost midnight, so I hopped in a local taxi. None of the back seats had any seat belts, and my driver was flooring it. I didn’t think my life was in danger until we blew past a couple red lights. Welcome to South America. It’s not the first time that Venezuela has found itself in the grips of crisis. Few commentators note that when Chavez came to power in 1998, it was already after years of economic turmoil. Venezuela had experienced an oil boom in the 1970s, the same period in which nationalization policies were first implemented in the industry. Reliance on oil money led to the deterioration of the country’s manufacturing base, a well-known phenomenon in resource-oriented economies called Dutch Disease. When OPEC members increased production in the 1980s, decreasing oil prices sent the economy into a downward spiral. Neoliberal reforms made from 1989 onward then gutted social infrastructure, radicalizing the working and lower-middle classes and leading Chavez to make a coup attempt in 1992. While this failed, non-establishment parties managed to win power the following year and pardoned the coup plotters. By 1998, GDP per capita had collapsed to around its level in 1963. Spending power was decimated from the late-1970s peak. That same year, Chavez rode a wave of popular support to electoral victory. But like his predecessors, Chavez relied on oil to build up the Venezuelan state and his Bolivarian revolution. The industry deteriorated as revenues were not being reinvested in new projects, and political concerns led to clashes between management and workers. With rampant corruption, and little by way of innovation, the dominoes were perfectly lined up for a price drop and some well-timed sanctions to set them toppling. Venezuela’s dependence on refineries located abroad made the country particularly vulnerable to such actions. One of its major revenue sources was the Citgo refinery, which is owned as a Venezuelan state subsidiary but located in the U.S. It has been hit hard by Trump administration sanctions. 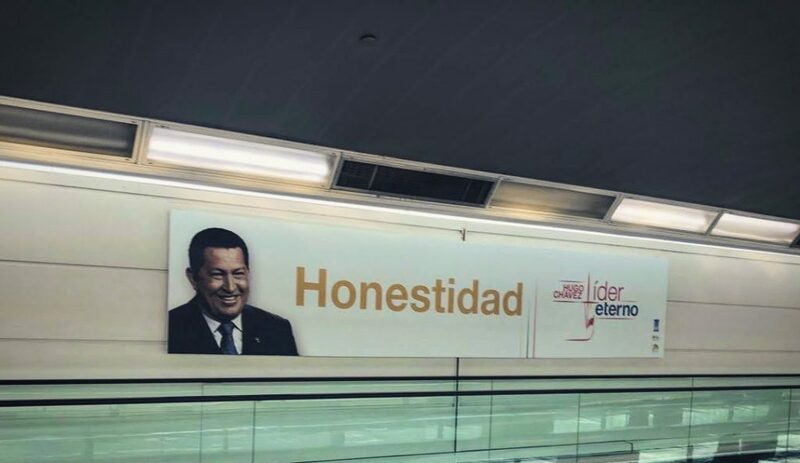 Perverse incentives toward corruption and against long-term planning in economic management ultimately crippled Chavez’s successor, Nicolás Maduro, just as they did his neoliberal predecessors. The development which the socialist government achieved through much of the 2000s could only continue as oil prices remained stable and governments remained friendly. As of 2014, Venezuela still had a higher GDP per capita than many other countries, including Colombia and Brazil. But of course, GDP can just be barrels of oil pumped, not food on the table. In 1950, Venezuela had the fourth highest GDP per capita in the world, trailing just behind New Zealand and Switzerland. It’s now ranked 131st as of 2017. The next day, like in lots of other Latin countries, I woke up to bright sun and the smell of motorcycle exhaust. I looked out of the window to see those big Bogotá mountains, then went to a cafe to meet my local guide. The plan was to talk to the latest batch of Venezuelan refugees, who regularly stream across the border from Cúcuta. I had heard they set up shop at the central bus station after taking 12-hour-long bus rides from the border. 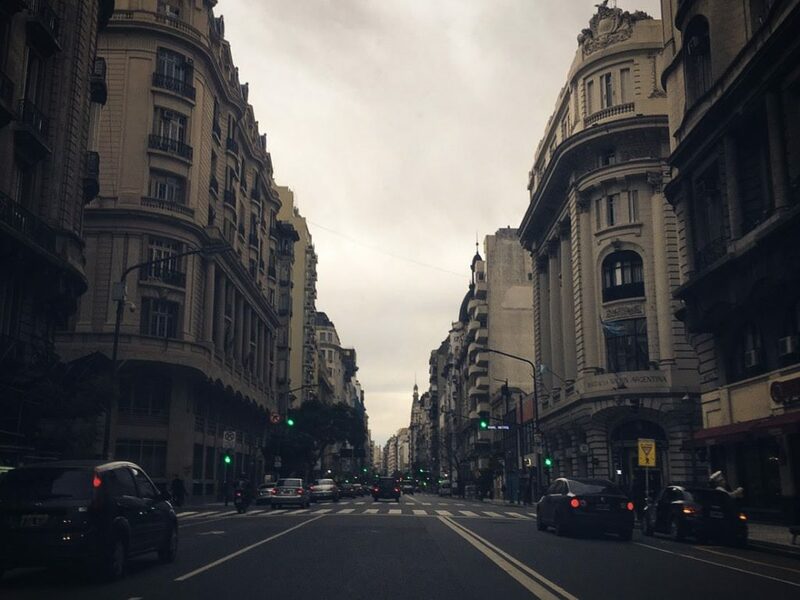 We hopped in a taxi and told the driver we wanted to head to the station, to which he replied, “No, los movieron”—the refugees had been moved. After a little prodding, he mentioned that the mayor ordered all Venezuelans to be sent to a camp much farther away from the city center. He said he could take us there, although it was “Muy caliente” which translates literally to “very hot” in English, but means something more like “very unsafe.” We went anyway. Twenty minutes outside of the city, as we approached the airport, a fenced-off soccer field came into view through the dirty windows. Blue tarps blocked all views of the inside. From the taxi, I could see military personnel patrolling the area. There’s a military academy conveniently located around the corner. At the intersection of Calle 49 y Carrera 69, I stepped out of the taxi and was swarmed at the entrance of the camp by a dozen or so Venezuelans aggressively inquiring as to whether I had any supplies for them. I knocked on the encampment door and a guard rushed me in and locked the gate behind. I told him I’m from the United States and looking to talk with refugees. As I waited for the guard to talk to his boss, I surveyed the camp. 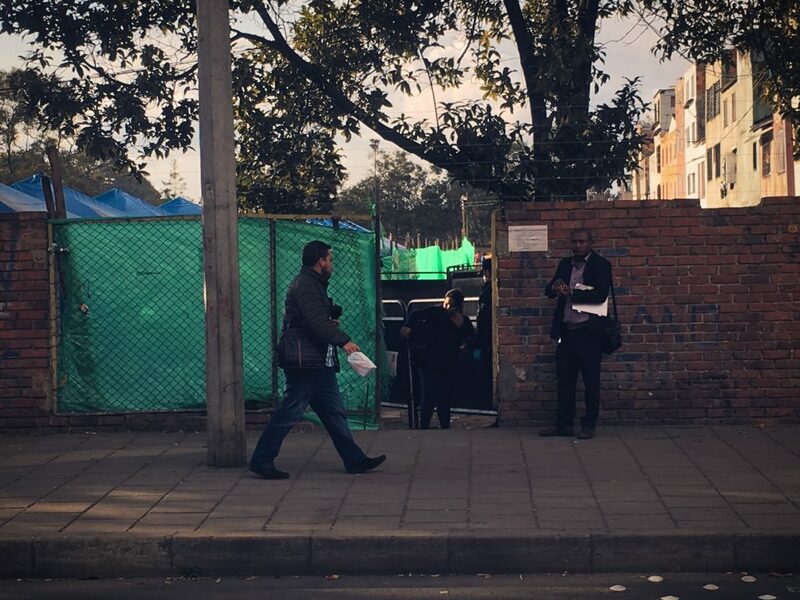 There was a code of conduct posted for the refugees on the walls, with a set of sixteen rules. The message was clear: violate these rules, and you’ll spend the rest of your nights out on the street. Spray-painted refugee messages covered the walls around the field, and roughly 20-30 blue and yellow tents lined the wasted away grass. No dice. After some back and forth, I decided to talk to the refugees outside instead. My first interview was with a man named Carlos who had arrived from Venezuela the previous month. Despite a very defeated look, he jumped at the opportunity to tell me his story. According to Carlos, he was the designated driver for a local opposition leader in the Venezuelan province of Maracaibo. His family members and friends warned him that working for the opposition meant he would be considered an enemy of the state. But he took the risk. He needed to continue saving enough money to get himself and his family out of the country. By the time he was ready to leave Venezuela, it was already too late. One night while driving home from work, he was ambushed by the local Chavista paramilitary. They dragged him out of the car and sawed off his leg. Left for dead, he crawled back into the car and stemmed the blood loss. Medical staff cleanly amputated his leg, gave him crutches, and sent him on his way. Two weeks later, he left for Colombia. From Maracaibo, he took a bus to the Colombian border city of Cúcuta. Venezuelan border guards took all of his belongings, leaving him with nothing but crutches and a mobile phone. This is a profitable business for the Venezuelan guards, given that five to ten thousand people a day cross the border through to Cúcuta. If you’re a Venezuelan looking to flee the country, that’s really your only way out. There’s no better way into Colombia; you either have to travel twice the distance, or navigate through dense jungle (parque nacionales) full of rogue revolutionaries who make their own law and trade in gold. Cúcuta is now a center of immigration, but it’s also the Schelling point of commerce, both legal and illegal, between Colombia and Venezuela. Given the food and energy shortages in Venezuela, you would expect people to import goods from Colombia at profit-off-the-collapse-tier levels of markup. But given the quixotic structure of the Venezuelan benefits state, there are strong market forces pushing in the opposite direction, as well. Desperado racketeers have made a lucrative business out of purchasing scarce and subsidized Venezuelan goods and exporting them to Colombia. In Venezuela, you can pump your SUV full of gas for the equivalent of about $0.05. In Colombia, petrol goes for about $3 a gallon. You don’t have to go through Y Combinator to know what happens next. Venezuelan grocery stores and petrol stations are drained wholesale within hours of new shipments. The government chooses to highly subsidize certain goods such as food and oil, which is the reason this dynamic exists. Goods owned by the state are for everyone, according to Chavismo, and when your country is in a downward spiral, the entrepreneurial thing to do is take as much of the free food and oil as you can, throw it in the back of a truck, and transport it to the border. I said previously that the only feasible way for regular Venezuelans to leave the country is through the Cúcuta border. But there is another way, at least for mafiosos doing a lot of business. No vehicles are allowed to cross from Venezuela to Colombia, so the only way to move large amounts of supplies is through the jungle. The military has cut some ad-hoc pathways, but there’s a price. Smugglers have to give up 10-15% of their goods to the soldiers in exchange for their assistance. Refugees don’t get the same deal from the Cúcuta border guards, probably because they’re not repeat customers. 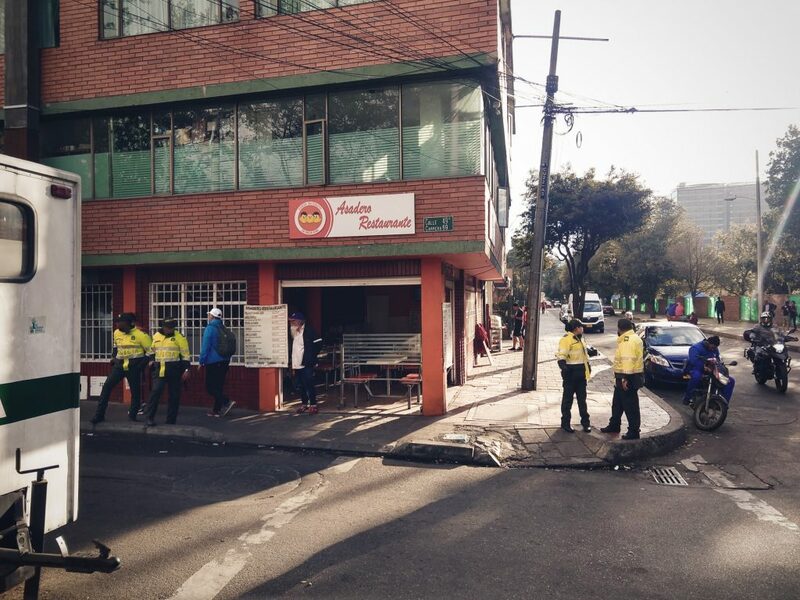 They don’t fare much better in Bogotá, either. Carlos told me that refugees are consigned to poorly-insulated tents with other families. For food, they are given sancocho (soup) and one bowl of rice a day. There is nowhere to safely store their personal property (if they have any at all). Theft is the norm, not just among refugees. Carlos mentioned that Colombian guards routinely siphon off humanitarian supplies. In one case, he witnessed the guards steal hundreds of Nike shoes, which they then loaded up onto their trucks as soon as the charity left. The refugees attempted a revolt, but there was nothing they could do except watch the guards’ trucks roll away. Emmanuel, another refugee, ended up at the camp the same way everyone else did—he crossed the Cúcuta border, was stripped of all his belongings by the guards, and found himself in Colombia with nothing but a Venezuelan ID card and no idea of what to do next. 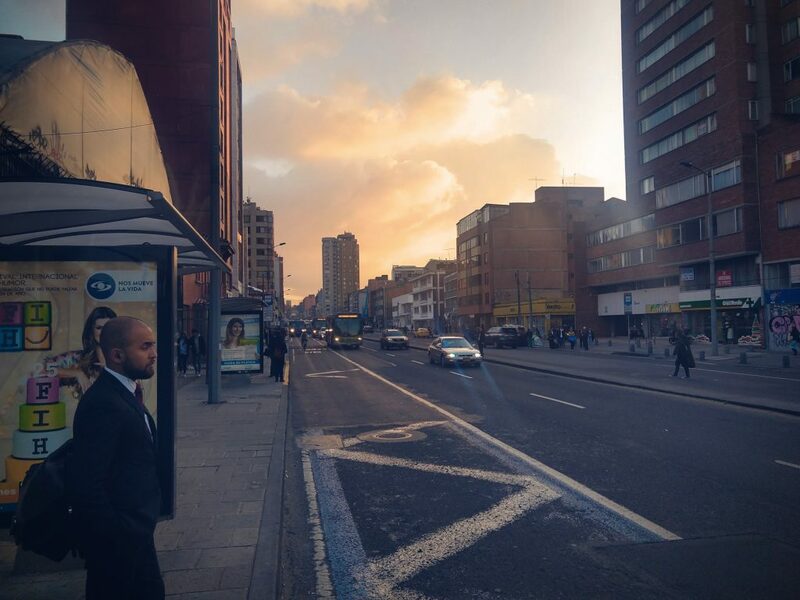 He found himself at the bus station and caught a ride to Bogotá in the hopes of finding work—any work. But that hasn’t panned out so far. The way he supports himself is via his Swedish girlfriend, who sends him €100 euros a month. He takes part of that money and sends it back to Venezuela, to take care of his daughter and wife. But even sending money back to Venezuela is a struggle. When he arrived at the camp, other refugees saw he had a newer Android model. They took it from him. He’s not a fan of Chavez. “He destroyed my country,” Emmanuel said in surprisingly good English. Emmanuel spoke to me in English whenever he could find the words. But not everyone is so anti-Chavez—especially Victor. I met Victor at the desk he leases from a department store in the Chapinero Central area of Bogotá. He calls himself a Chavista. He operates a small informal currency exchange as his main source of income. The formal currency exchange system is extremely unreliable; at any given point in time, foreign currency exchange is either banned in Venezuela, or the central bank offers extremely bad rates. So, there’s now a massive, decentralized network of informal currency exchange vendors across Venezuela, Colombia, and the United States. Currency dealers manage to do all this without wiring money across borders. There’s a word for this in Arabic, Hawala, which is also how al-Qaida and Somali pirates move money internationally. The currency operation has a vendor in each country, for example Colombia and Venezuela. When a customer in Colombia wants to send money to someone in Venezuela, they give the desired amount in Colombian pesos to the currency man in Colombia, in this case Victor, who then directs the currency man in Venezuela to dole out the corresponding number of Bolivars to the target recipient (accounting for their fee for providing the service). The vendors move money across borders the old-fashioned way. Victor has his fixer in Colombia take all of his Colombian Pesos, drive 13 hours from Bogotá to Cúcuta, and then use the Colombian Pesos to purchase Venezuelan Bolívars at the border at a much better rate than he could get in Bogotá. Any currency the Venezuelans still have on them that hasn’t been taken by the guards is quickly dumped right across the border at a favorable exchange rate for the Colombians. The Bolívars are then smuggled into Venezuela. But even Victor’s informal currency exchange shop is one of the more formal ways this service is provided. Venezuelans have had to get really scrappy with their financial system. Following the trail of Venezuelan informal currency exchange unveils an underground world where you and everyone you know is constantly trading between currencies and desperately trying to preserve purchasing power. In an effort to hold as few Bolívars as possible, citizens have resorted to trading with their compatriots with American or Colombian bank accounts via Facebook messenger, Instagram, or Whatsapp. In quick handshake deals, they commonly post their story requesting to buy or sell U.S. dollars. When someone bites, they transfer money via bank wire or online services such as Zelle or Paypal. This is typically done at rates of $10-$100 at a time. 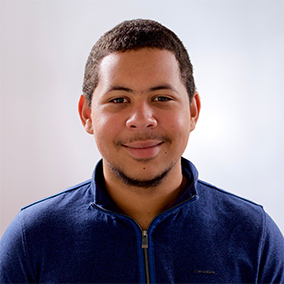 Victor, on the other hand, moves the equivalent of $40,000 USD in Colombian Pesos every month; and Victor isn’t even the guy—he’s just a single vendor who’s part of a larger organization. I asked him what he thought about the currency crisis, and how he got into the business. Yes, he made the claim that the U.S. is bringing actual dollars to Venezuela, causing massive numbers of people to dump the Bolivar in favor of dollars, thereby causing the Bolivar to massively depreciate. I asked him to elaborate. He told me that the U.S. has been running similar schemes for years. It’s part of America’s plan to destroy Venezuela and take the country’s oil, he continued, as it’s one of the only countries in the West not under American control. Other than flooding the markets with dollars, Victor said the U.S. attacks independent countries by imposing sanctions and trade restrictions, and even poisoning socialist leaders. As an example, he cited Cristina Kirchner, the former Argentine president, who was diagnosed with thyroid cancer in 2011, She was later found not to have had cancer at all. Unmoored paranoia is what you might expect in the backdrop of a long history of covert U.S. efforts to overthrow Latin American governments. There’s no knowing precisely which shenanigans are U.S.-instigated, so it makes sense that people tend to overfit the models. Victor’s face suddenly turned nostalgic, as he proceeded to tell stories of the rich Venezuela he still remembers—when people desperately wanted to come to Venezuela to find work and send remittances back to their families in less prosperous countries. They didn’t just pour in from Colombia. They came from all over South and Central America and the Caribbean. At one point, Victor even had friends from Spain who wanted in. And why wouldn’t they? Without civil unrest, Venezuela is a beautiful place. Venezuela has every climate imaginable within driving distance of Caracas. It has big mountainous regions, beaches, rain forests with waterfalls, and desert. Even powdery white snow. Given the crisis in Venezuela, it’s not a surprise that much has been made internationally of the possibility of a military conflict in the country—if not a totally endogenous one, then one instigated by the various foreign powers with interests in the country’s future. Although the most notable and powerful player is the United States, which is maintaining that “all options are on the table,” any analysis of the situation would be remiss without mentioning the influence of the Russians, Cubans, Chinese, Brazilians, and Colombians. Impossible-to-ignore news items like the appointment of Elliot Abrams as U.S. Special Envoy to Venezuela, a central figure in the Iran-Contra affair convicted of withholding information from Congress, and Senator Marco Rubio’s tweet of a photograph of the bloody and beaten Muammar Gaddafi, have drawn people’s attention away from the hard institutional, geopolitical, and military facts on the ground, which deserve their own treatment. Since its independence from the Spanish Empire in the early 19th century, Venezuela has never been invaded by a foreign power. The country’s geography invites no invasion. The southeastern half of the country, an area the size of Texas, is covered in thick jungle and borders more dense areas in Brazil, Colombia, and Guyana. The less impassable and much more populated northern half of the country follows the coast of the Caribbean Sea to the Venezuelan-Colombian border, itself running through more jungle and mountains. A land invasion of Venezuela would thus be very difficult to pull off. Invading from the southern jungle is infeasible. An invasion from the west—from Colombia—would be comparatively feasible, but would face a 500-mile slog through less-than-hospitable terrain and urban areas to reach the capital Caracas. The obvious strategy for an invading force would be an amphibious landing to seize the capital, a strategy considered by the German Empire during a dispute with Venezuela in the early 20th century. Occupying the capital is also, in practical terms, a far cry from occupying the country. Even further out of reach is pacifying the country, let alone bringing “freedom and democracy.” Just ask Paul Bremer. And much like in the U.S.-led wars in Iraq or Libya, there are more than a few people standing in the way of peaceful, or even armed, regime change. The Venezuelan Army would not be the only group to take up arms in the event of a conflict. In addition to the official army, navy, and air force, Hugo Chavez created the National Bolivarian Militia of Venezuela in 2009. The militia was described as a “political army” by El Mundo in 2014 and now stands at over 379,000 members in active or reserve duty. Maduro announced an expansion to 500,000 militia members in 2017, with an eventual goal of 1.1 million active duty members, and promised to purchase a rifle for every militia member. There is also a widespread network of paramilitary gangs called colectivosthat, according to The New York Times, control a full 10% of all cities and towns in Venezuela. They also have deep ties to the government, in some cases from the days before Chavez took power. One group, the Tupamaros, have been tied to Chavez since the early 1990s and included radicals toughened from prior involvement in leftist political factions and guerilla groups. The group now carries out a mix of social work, vigilante law enforcement, attacks on government opponents, and suspected criminal activity, alienating other leftist organizations with their hardline approach. These aren’t your ordinary American thugs: the colectivos are armed with AK-47s, submachine guns, grenades, tear gas, and are organized around a militantly left-wing, pro-Maduro ideology. They would be some of the most formidable opposition in the event of larger scale intervention by the U.S. or its allies. Unlike members of the militias, their members have often been tested in street conflicts during opposition rallies, and in some cases collaborative operations with the Venezuelan government. Taken together, one gets the impression of a militarily organized Venezuelan state with the capacity to mobilize large segments of the population. Maybe they can—but here’s the punchline: the Venezuelan Army itself only has 71,000 personnel. In the event of a domestic conflict wherein the entire army turned against him, Maduro might still be able to muster more armed forces in response at a ratio of more than five-to-one. While the regular army is likely to be more coordinated and competent than irregular pro-Maduro forces, they would still be greatly outnumbered in manpower and have an intractable guerilla war on their hands. This might be the reason why a coup hasn’t happened yet despite several attempts, the known historical ambivalence of the army towards Chavismo, and the forthright vocal support of the President of the United States. They know something everyone else doesn’t: they couldn’t win if they tried. This isn’t even delving into Russian, Chinese, and Cuban military and intelligence support of the Maduro regime. There have been reports of the now-infamous Russian private military company Wagner Group seen in the Miraflores palace advising Maduro. Using the word “advising” might be a bit misleading. A report from Reuters suggested there might already be up to 400 Wagner mercenaries in Venezuela. Wagner Group only numbers some 6,000 men, who have already been deployed to the wars in Ukraine, Syria, Sudan, Libya, and the Central African Republic. They’re probably most famous for allegedly suffering over 100 casualties from U.S. airstrikes in Syria during an attempt to capture a gas field. These guys aren’t consultants. They’re not even bodyguards. They’re infantry. Shortly after I left Colombia, Conrad touched down in Caracas. You can only fly into the airport during the day, because during the night, there’s a high probability you’ll be kidnapped, assaulted, or robbed outside the airport. Or all three. Just in case, Conrad had private security. In Venezuela, you can’t just go online and hire private security. Everything works based on a private vouch and reputation system. You have to know someone. During his time in the country, Conrad didn’t meet a single person who hadn’t been kidnapped, assaulted, or robbed. These complaints aren’t without merit. It’s not news to anyone that hyperinflation is dire in Venezuela. But what’s interesting is the specific strategies Venezuelan merchants use to circumvent currency devaluation. It’d be weird to walk into a restaurant in the United States and try to pay with anything other than USD or a credit card. 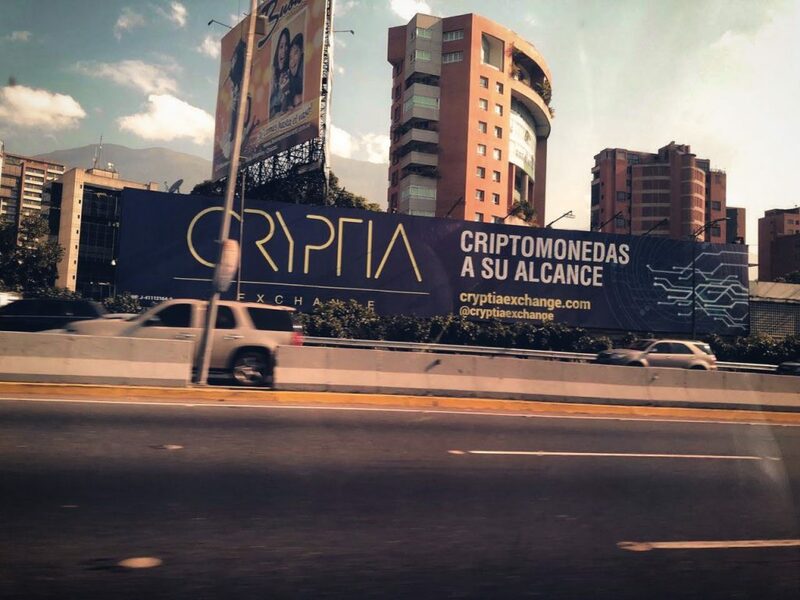 In Venezuela, they’ll take anything you’ve got: PayPal, Bitcoin, Litecoin, Zelle, USD, Euros, anything at all—they’ll give you a discount for it, too. Some merchants have even resorted to using LocalBitcoin to exchange Bolívars to Bitcoin and vice versa. This is the only way to survive under 10% currency devaluation a day. Merchants were adamant about the fact that they literally could not “sleep on it.” In Venezuela, you have two full-time jobs. Your first job is doing whatever is necessary to scrape together some money, and your second job is doing whatever is necessary to save it from rapid devaluation. No one really uses straight cash at this point. Instead, they prefer bank wires. To acquire cash, you have to pay a premium because there’s basically no physical paper left to print Bolívars. The physical paper shortage also applies to toilet paper. There isn’t much of it around. If you have some at your hotel, you may have to bring it with you. Food is also scarce, a subject which has been somewhat controversial. Nevertheless, Venezuelans are losing an average of 24 pounds a year. Currently, the reality is that if you’re not so well-off, you’re in trouble, though if you’re wealthy, you can find food in places normal people can’t afford. But the closest store to a Whole Foods in Caracas was empty. Nothing on the shelves. There was no asparagus water. Other grocery stores were similarly empty. But there’s still life outside Caracas. Conrad took a flight to Porlamar—about 300 miles outside the capital—to better understand the situation in the rest of the country. It cost him a grand total of $5. Free fuel from the state and a free-fall currency will do that. Once in Porlamar, he hailed a taxi. The taxi is essentially scrap metal with some wheels strapped to it. There are no seatbelts. You can see the rust inside the car. That it runs at all is proof that God exists. The taxi took him to a traditional Venezuelan dance show. Unlike Caracas, everyone here was cheerful and clearly enjoying themselves. After the event concluded, Conrad and his driver returned to the car, only to find shattered glass all over the ground. People had broken into the car to take a micro USB cable on the floor, the car battery, and the spare tire. He hailed another cab. So much for Porlamar. Some Venezuelans are willing to do a lot worse for a lot less. While I was in Argentina, I met a woman who had previously lived in Caracas. She has no kids, but she does have siblings and parents still living in Venezuela. Her primary plan was to work for an international company that would pay her in a currency other than Bolívars. Once she had saved enough money, she hoped to emigrate with her whole family out of the country. That plan ended abruptly. She decided to leave her family behind when she was robbed at gunpoint for her ice cream cone while out at the main Caracas shopping center. The next day, she took all the money she had saved up, stuffed it in her brassiere, and took off for Brazil. She was stopped and searched at more than 20 military checkpoints on her way out of Venezuela, each time letting soldiers know her intention was to go on vacation. She was the first person in her family to escape the Chavista state. Chavismo in Venezuela is partly derived from a desire to be free of American influence. By invoking a “Bolivarian” revolution during his rise to power, Chavez was consciously taking up the mantle of a long tradition of Latin American independence dating back to Simón Bolívar in the early 19th century. The foe has now changed: Bolivar fought against the Spanish and ruled much of Central America under the liberal Enlightenment republic of Gran Colombia, while Chavez set his sights on the U.S. Despite the crisis, the government is maintaining this approach, which manifested in the state’s creation of a new cryptocurrency called the Petro in February 2018. The story is that the Petro is meant to fight hyperinflation, but it seems to be a low-effort collaboration with the Russian government to evade the heavy hand of U.S. sanctions. But as far as hyperinflation is concerned, the Petro is irrelevant. No one trusts the currency because it’s run by the government, and no one trusts anything the government runs. As a result, the government has had to aggressively nudge its citizens, mainly by paying state pensions and salary bonuses with the Petro. Supposedly, the Petro is backed by Venezuelan oil and diamonds. From a monetary policy perspective, the main problem with the Petro is that, just like the Bolivar, it fails to fulfill the core functions of currency. It doesn’t maintain purchasing power, no one will accept it, and it’s a very poor unit of account. It’s questionable whether it can actually be redeemed for any of the underlying reserves, if backing for it exists at all. In order to build trust in newly created currencies, the issuers must be willing to prove that they are willing to redeem their currency at the claimed exchange-rate for assets people actually want. Yet to date, as far as I know, no one has been able to redeem the Petro for anything. However, for the Venezuelan state, these half-hearted attempts may be superior to joining the SWIFT financial transfer network. Substantially relying on SWIFT for high volume transactions, and then having the U.S. exert strong pressure, could result in an uncomfortable dilemma: comply with U.S. interests, or face the prospect of losing SWIFT access, leading to economic travails. Iran learned this lesson the hard way last year. SWIFT is apparently a neutral entity, but the network cut access for Iran’s central bank last November after the U.S. Treasury Department leaned on the company. Cryptocurrencies are a way of building around U.S.-controlled or influenced financial systems. With a more competent state, the Petro might have been a threat. Both Simón Bolívar and Chavez are united by a centralist approach, which sees a strong state and continued popularity among military personnel as necessary for independence. Despite the association of Chavez with socialism, his early administration tended to invoke “third way” rhetoric and unite different factions under a patriotic platform. His embrace of socialism occurred around 2005, and seems to have been the culmination of a radical shift. This was largely spurred by a coup attempt, mass strike, and a failed recall referendum by the opposition. The concrete realization of this project was in the building of a new order of the Venezuelan state. During his time in power, Chavez and his party used oil revenues to fund a wide array of state initiatives and new institutions. Much of the current conflict centers around Maduro’s use of these institutions to isolate the opposition and the National Assembly. Among the immediate measures taken were the Bolivarian Missions. The nature of these missions varied widely, but their unifying goal was to secure Chavez’s base among working class and rural Venezuelans, and to develop medical, educational, and social infrastructure. Corruption and unsustainable oil funds have led to deterioration of these initiatives, along with much of Venezuela’s infrastructure. The food-distribution networks of Mission Mercal have faced shortages. The Cuban doctors who helped staff the medical efforts of Mission Barrio Adentro, and whose presence spooked so many American observers, have been pulled out as Venezuelan payments have become irregular at best. And so on down the line. A more radical shift in Venezuela’s institutions was the enactment of the Law of Communal Councils in 2006, which was supposed to enable citizens to create local and direct democratic bodies, varying from 20 to 400 members in size. Nearly 20,000 of these bodies were ultimately established and given funding. Chavez himself envisioned them as the route to building a communal and civil socialist infrastructure beyond the “constituted power” of the state. They also allowed the central government to circumvent entrenched and more conservative local power centers. However, many in the Chavista camp viewed them with confusion and even suspicion. By their nature, the councils embodied local concerns and local corruption. Furthermore, dedicated Chavistas perceived that the council members’ attention to mundane concerns undermined their commitment to Bolivarian goals. And while funding went to any number of local projects, Venezuela’s infrastructure lacked sufficient investment and the country remained beholden to rival powers. Despite this, the councils played a role during the tumult surrounding Maduro’s creation of the National Constituent Assembly in 2017. At the time, the opposition-controlled National Assembly had been declared in contempt of court by the Supreme Tribunal of Justice, which was staffed by Bolivarian loyalists. Maduro then declared the creation of a new electoral body. The government invoked the institutionalization of the communes as one of the drivers of the decision, and they were among the special sectors chosen for direct representation on the assembly. Maduro and his officials were willing to endure widespread domestic backlash and international opposition to push forward on these fronts. This decision shows just how strongly the government prioritized the construction of permanent, Chavista-dominated political institutions. Insofar as a heavily corrupt system is able to maintain overarching strategic and ideological goals, these decisions reveal what they are. To build or maintain an autonomous, non-liberal democratic state in the 21st century, you need a few things: first, some amount of ideological sovereignty in the ruling class, such that this class is largely free of the influence of foreign ideologies with radically different conceptions of what it means for a state to be legitimate, and what that state ought to concern itself with. Second, strong trade and industrial policy that emphasizes domestic production, so as not to be reliant on imports of crucial goods that can be cut with sanctions. When looking at the geopolitical calculus given the objective of sovereignty, it’s clear that any loss of economic efficiency is essentially irrelevant (see North Korea). Third, it’s helpful to have a natural resource base to cover any imports that absolutely cannot be produced internally. But a competent state also needs to carefully plan ahead to hedge against commodity fluctuations—which reduce tactical optionality—by diversifying economic operations and establishing long-term sovereign wealth funds. Fourth, methods of conducting commerce that route around standard international financial systems, which are often susceptible to U.S. influence. The Maduro regime has already found out the hard way about trusting the international financial order. Venezuelan officials to the Bank of England: Hey, can we have our $1.2 billion in gold reserves back now? Finally, to pull off the above feats, the state needs a highly competent, coordinated ruling class capable of executing good statecraft. It’s also helpful not to be located in the Western Hemisphere. The further away from the U.S., the better. Unfortunately, Venezuela has none of these prerequisites. A large proportion of Venezuelan elites have not bought into Chavismo. Many of them have already abandoned the country, leaving fewer and fewer competent people in charge. Maduro may have been specially trained by the Cubans, but the Cubans specialize in fomenting revolutions and community organizing, not competent statecraft. After Chavez’s death, Venezuela needed a strong leader to keep the country from flying off the rails. That leader was supposed to be Maduro. Except Maduro is a bus driver-turned bodyguard-turned head of state. Chavez had a history of choosing unwavering loyalty over competence and expertise. These two characteristics aren’t necessarily mutually exclusive, though in government they tend to trade-off against one another. In his younger days, Maduro played guitar for his rock band called Enigma. When that didn’t pan out, he dropped out of high school and joined a Marxist-Leninist organization called La Liga Socialista. They sent him to Havana, Cuba, where he was mentored by high-level members of the Communist Party, who in 1986 helped jump-start his political career in Venezuela. Maduro started out by working for the Caracas Metro System. After his short stint as a bodyguard, he worked his way into the appointed offices of Foreign Minister and Vice President, as a result of strong loyalty to Chavez. In case you haven’t heard, the Cuban deep state in Venezuela is very real. Maduro doesn’t even receive his daily briefings from Venezuelan intelligence. The briefings come from Cuban intelligence. Russia assists with military advisors and financial systems design. China has turned Venezuela into a proving ground for social control technology, which helps to track intricate details about citizens and potentially identify dissidents. The secret is that despite its pretensions to autonomy, the Venezuelan state is extremely porous—especially to states outside the U.S.-dominated order. Venezuela is also largely dependent on oil exports. The state failed to plan ahead by diversifying its economy or saving money. It also lacks the ability to refine oil locally, further increasing its vulnerability. And while the Petro is an interesting attempt to work around the U.S.-influenced financial system, the government itself is corrupt enough that no one trusts it. Venezuela is also located squarely in the Western Hemisphere. Zero points. 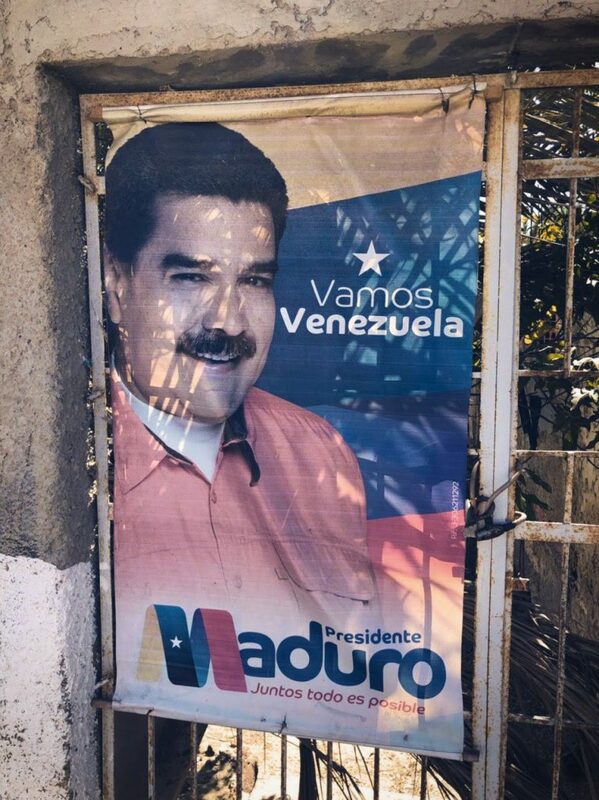 Since non-Maduro-loyalists have been purged, it’s almost inconceivable that the current regime would reform Venezuela along liberal, free market lines, as doing so would open a strong vector for U.S. influence through NGOs and market power. This would contradict how the regime conceives of itself: as an autonomy maximizer—at least with respect to America—and a social benefits maximizer. Additionally, to expect state corruption and predation surrounding the use of natural resources to vanish after a liberal transition ignores the fact that free market systems are implemented within specific contexts. Privatization does not solve endemic cronyism, as Russia’s transition during the 1990s illustrates. Conceptions of privatization in some ideal state are not useful when actually implementing it in the context of a historically corrupt and incompetent system. Given its self-conception, the Venezuelan state is stuck with some form of social nationalism, if it intends to maintain autonomy vis-a-vis the U.S. But this isn’t to say that serious reform within that constraint is impossible. Far from it. For example, not every state with nationalized natural resources or a large social benefits structure sets money on fire with stupid and unsustainable programs. Not every state allows its military to siphon off a substantial amount of supposedly communal resources for personal profit. And not every state chases its most competent people out of the country. In fact, expansive social benefits programs are not uncommon today. Neither are state-owned natural resources. But the bar for running a successful state is a lot higher when trying to operate outside the liberal order, which is why Venezuela is in such a difficult spot. It simply isn’t good enough to clear the bar. Watching a state with a desire for autonomy slowly self-destruct is not a pleasant experience. Total autonomy in the U.S.-dominated Western Hemisphere requires competence, ingenuity, and a willingness to trade off economic prosperity against outside control. Not every group capable of taking over a state and maintaining its own power is also capable of good government. The sweet spot is both. Venezuela is clinging on to one of those two things for dear life, and it isn’t good government. Is Venezuela socialist? On the one hand, much of its economy has never left private ownership. On the other, it’s ruled by a socialist party which has reshaped the state and the most profitable national industry along socialist lines. Government spending is only 40 percent of GDP, but it’s jumped from 28 percent in 2000. Roughly 90 percent of exports are oil. So, let’s take them at their word. However, this seems like the wrong question altogether. If we are explaining the failure of the Venezuelan state, more important is the fact that the country is an adversary of America, the region’s hegemon, and also suffers from leadership that is utterly incompetent at carrying out its own stated goals. The Bolivarian government gave itself the mission of becoming sovereign from U.S. influence and using Venezuela’s resource wealth to build up the country. More direct controls on oil were never going to achieve this goal long-term. The country needed to develop its industrial infrastructure and become less dependent on U.S.-centered economic institutions. While Chavez went around making bombastic statements about the “Yankee empire,” his lavish initiatives counted on American companies giving him their business year after year. Later deals with China and several South American countries never permanently altered this relationship. Different approaches taken toward other hegemons like Russia by Ukraine and Kazakhstan offer a good comparison. Ukraine was taken over by a western-aligned faction that saw Russia as a threat and pressed to immediately maintain its eastward sovereignty. It turned west, toward Europe for support, but ultimately paid high economic and military costs. On the other hand, Nursultan Nazarbayev, president of Kazakhstan, opted to continue friendly relations with Russia as its own development continued, and is deeply entwined with it in trade and industry. Now, Kazakhstan has also built relations with China, Turkey, and the West—all while maintaining a delicate balancing game with Russia. To make the U.S.-Venezuela comparison: Chavez took a Ukrainian attitude towards diplomacy, and a Kazakh one towards economics. The position was untenable. Venezuela poured money into social programs designed to shore up political support. Even strategically useful ones, such as education, set up young Venezuelans to enter an economy in which non-oil exports had collapsed and the currency was moving from overvaluation into hyperinflation. Most importantly, the ongoing and entrenched problem of corruption undermined these ventures at every side. None of these problems were entirely original to the governments of Chavez and Maduro, but all were exacerbated by them. Things aren’t over yet. Venezuela may still limp onward. The North Korean and Cuban states made it through much worse when their Soviet lifeline collapsed back in the early 1990s. But they had far more unified states and continuity of leadership. In the alternative scenario of a successful U.S.-backed coup or internal uprising, huge swathes of the population will see the new government as illegitimate and the successor regime will have to pacify neighborhoods filled with people who will probably be loyal Chavistas until their dying day. Not to mention unchained colectivos with little left to lose.